The hubbie and I recently ate the most gorgeous Korean food at our local food market and, after being reminded of the wonderful flavour combinations from the area, I thought it was about time I added another recipe to my Korean collection. You can buy Korean chilli paste from most Asian supermarkets or you can buy it online (I bought mine from souschef.co.uk). It has the most amazing flavour; a little savoury, a little sweet but nice and spicy. I also ordered the Korean chilli powder at the same time but, if you don’t like things too hot, you can leave this out (or if you like it hot but don’t have this ingredient, replace with ½ tsp normal chilli flakes). This chilli paste is definitely worth investing in and will feature in a few of my upcoming recipes too! For 11sp this dish really is a bargain! Combine all of the marinade ingredients with a small dash of water (up to 2 tsp) and stir until the chilli paste has dissolved. Pop the chicken in a large bowl and then add the marinade, coating well. Marinade for at least 30 minutes (or up to 2 hours). Next pop the rice on the cook. Then either sprialize or julienne peel the courgette and cucumber. Pop into a bowl, top with a little white wine vinegar and toss through. Pop in the fridge until you come to eat. Next, spray a wok with 1kal and then add the onion and pepper. Season. Fry on a high heat until the onion starts to soften and then add the chicken (reserving the marinade in the bottom of the bowl). Stir fry the chicken for 6-8 minutes until cooked through and then add the rest of the marinade. Reduce the heat and simmer until the chicken is nicely coated in the marinade. 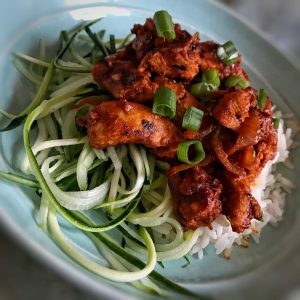 Finally serve the spicy chicken on top of the rice, add the cucumber and courgette salad to the side and top with a sprinkling of spring onions (and a pinch of toasted sesame seeds if you have them). This sounds delicious. I think both hubby and me will definitely be trying this. Thank you. I actually had it in the fridge as my 18 year old daughter loves cooking & gets lots of recipe off youtube and had used it in a few of her recipes. I look forward to trying out your future recipes. This was absolutely amazing Laura. I didn’t use the red pepper powder as my husband isn’t keen on anything too hot but I will sneak in a little when I make it again! I managed to find the gochujang chilli paste in Waitrose in their Cook’s Ingredients range, £1.65 for a small jar.